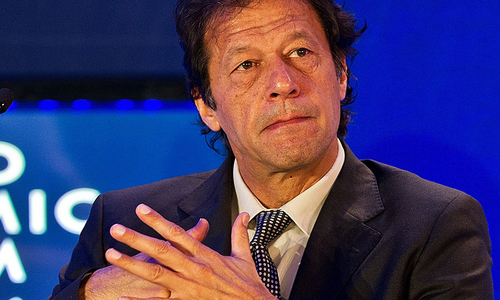 A six-member caretaker federal cabinet was sworn in at a ceremony held at the President House, Islamabad on Tuesday. 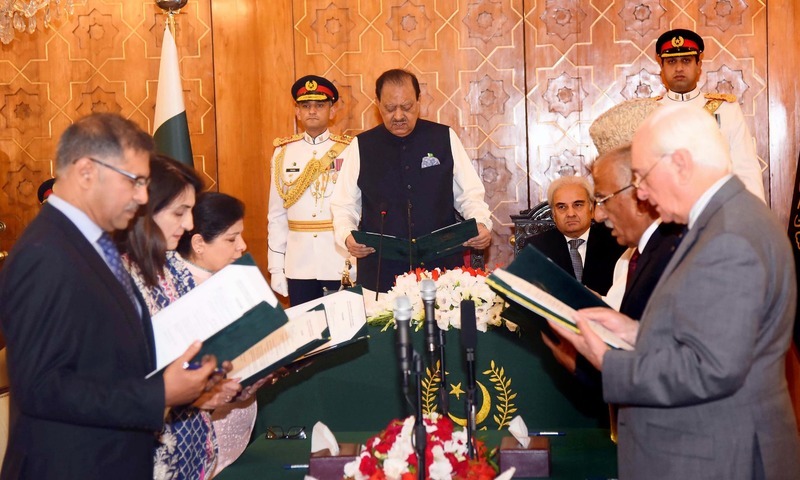 President Mamnoon Hussain administered the oath to the newly inducted members of the cabinet, who will assist the caretaker prime minister, retired Justice Nasirul Mulk, in managing the country till elections are over. 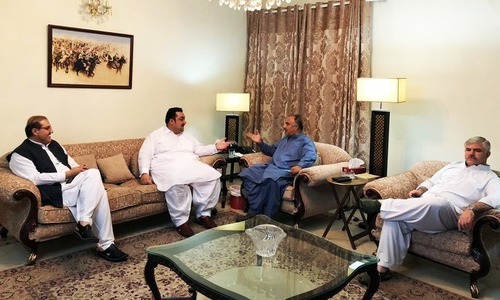 Those who took oath today include the State Bank of Pakistan's former governor Dr Shamshad Akhtar, Roshan Khurshid, Barrister Ali Zafar, former ambassador to the United Nations Abdullah Hussain Haroon, Azam Khan and Muhammad Yusuf Shaikh, Radio Pakistan reported. The ceremony was attended by the prime minister, along with other dignitaries. The caretaker cabinet will serve until a new government is elected through the 2018 general elections scheduled for July 25. Abdullah Hussain Haroon: Ministry of Foreign Affairs and National Security Division. Additional portfolios: Ministry of Defence and Ministry of Defence Production. Dr Shamshad Akhtar: Ministry of Finance, Revenue and Economic Affairs, Ministry of Statistics and Ministry of Planning, Development and Reforms. Additional portfolios: Ministry of Commerce and Textile and Ministry of Industries and Production. Azam Khan: Ministry of Interior, Capital Administration and Development Division and Ministry of Narcotics Control. Additional portfolios: Ministry of Inter-Provincial Coordination. 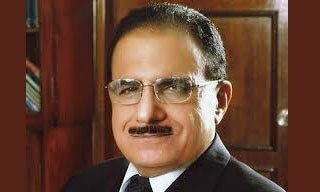 Syed Ali Zafar Shah: Ministry of Law and Justice, Ministry of Parliamentary Affairs, Ministry of Information, Broadcasting, National History and Literary Heritage. Mohammad Yusuf Shaikh: Ministry of Federal Education and Professional Training. Additional portfolios: Ministry of National Health Services, Regulations and Coordination and Ministry of Religious Affairs and Inter-Faith Harmony. Roshan Khursheed Bharucha: Ministry of Human Rights, Ministry of Kashmir Affairs and Gilgit-Baltistan and Ministry of States and Frontier Regions. All are respectable names and will deliver respectably. Keeping the cabinet small is irrelevant. In fact a big cabinet can bring more benefits if right people are chosen. The cost of 20 more ministers can be far outweighed by economic benefits generated by the efficient and professional ministers. Respected people - I personally appropriate PM for small cabinet with well known professionals. Size of the cabinet does not matter if the ministers appointed have knowledge and experience to run their ministries as they can bring economic prosperity which can far outweigh their salaries and perks. No minister for water and power? Very sensible joining and amalgamation of Ministries. A law must be made to stop ministries being awarded as trophies to the political workers of the party. Q'maan just six ministers and every minister loaded with numerous ministries..
Good luck ,interim govt. your actions and omissions shall be under very close watch , and it’s no news to you all . Let’s see how you conduct Elections that are non controversial . No easy task . One of the great combination of peoples. And all relevent departments are merged with single person. That's good. And upcoming government must b select educated and disciplined person for each ministry. I like this cabinet. They are well accomplished people. 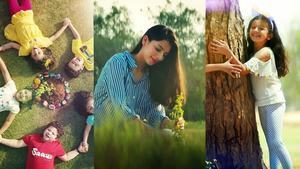 Pakistan was create for the enjoyment of these particular creature. The system is stagnant and faces of this special class of people are seen changing whether it civilian or military of caretaker government. I just hope they will be able to visit their respective departmemts and remeber the way to office before their tenure ends!!! Well Deserved. Good to see a Parsi representation in the cabinet. Congratulations ! A minority in the cabinet !